Mining is a process of extracting ores or minerals from the earth's surface. The gears are used for increasing the torque applied on the tool used for mining. They are used for commercial gold production, and coal mining. In 1769, a steam engine was invented by Newcomen and rotary motion was given by James Watt. This engine was used to move ores easily from mine's low levels to the surface. This gave way to devices that took men deeper and deeper into the bowels of the earth to harvest minerals more precious than gold. There after, with the passage of time gears came in use for mining. 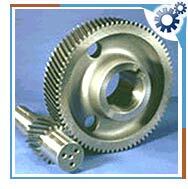 Worm gears - Used to transmit motion between perpendicular, non-intersecting shaft. Helical gears - Transmit power between non-intersecting shafts. Planetary gears - Shares the transmitted load between the four planet wheels achieving high torque. Crown wheel gears - They transmit torque by sliding contact. Spiral bevel gears - Used to give high performance. These gears are easy to use for high load. Helical gears - Placed on the main drive and is used for mesh test. They are also used for power transmission between non-intersecting shafts. Bevel gears - To transmit power between parallel shafts.